The most striking and surprising presentation at the Monki Gras developer event in London earlier this week was from two quietly spoken men from the UK government’s Cabinet Office. James Stewart and Matt Wall work on the Government Data Service (GDS), and what they are doing is revolutionary. What is the GDS? “It’s a new branch of the cabinet office which exists to deliver public services, public sector information in-house, rather than the traditional out-sourcing model,” they explained, though it turned out to be rather more than that. Wall described his experience of talking to government workers about their IT needs. A common thing you see from very small to very large is someone in government who wants to get something done, who has a business problem or a user need that they want to serve, surrounded by a complex array of integrators, vendors, contractors, suppliers, and all of that, kind-of locked into that, their ability to manoeuvre or deliver services [is limited]. We want to move from government procuring systems to government commissioning them, whether we build them ourselves, or just that we know what it is we’re asking for. We need that knowledge. This is also about breaking the hold of the large vendors and finding ways to work on a smaller scale. If you want to buy something in government, traditionally, some software or some system, the amount of momentum that you have to get up, the amount of people you can easily engage with, they tend to be from companies that are absolutely vast and they tend to take projects that are absolutely vast, the whole mechanism of working is stultifying for everyone involved. It is not just us, a small group of developers sitting in an office able to write some stuff, because that’s not scalable, you can’t do that for everyone. It’s finding small to medium sized companies, partners, out there in the market and finding ways to engage them … why should five very large companies get all the work? Mike Bracken and the Cabinet Office minister Frances Maude are currently on the West Coast of the USA, they said. They were invited to meet the usual suspects, Oracle, the major systems integrators. They cancelled it. They’re visiting Joyent, they’re visiting 10Gen, they’re visiting Twilio [applause]. It’s a wholesale change. We’re looking at how great web services are built. There is also a commitment to open source. “All of the code that we’re producing is open source and out on the Internet,” they said. The GDS is currently only about 30 people, 10 of whom are developers. How much impact can such a small team have? We’ve just started and we’re very small. We’re already having a significant impact in some quite large and some quite small projects. The incoming demand that we face across central government and local government is absolutely astronomical, and one of the things that’s important to resolve over the coming years is how to manage that demand and provide services, abilities and communities for people . . . we never want to parachute into somewhere, rewrite all the systems and then go off somewhere else., that’s not sustainable. Can this small group really change government IT so profoundly? That is an open question, and perhaps in the long term they will fail. There is no doubting though that this particular team is doing inspiring work. This blog post from GDS yesterday describes how open source participation was used to fix a government web site; it may seem a small thing, but as a new and different approach it is significant. 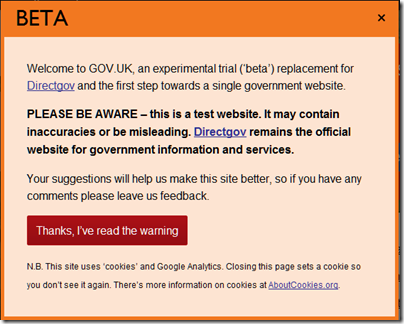 For more information see Mike Bracken’s post This is why we are here, and take a look at the team’s early work on GOV.UK, which is in beta.